Date of birth: Prehistoric time, indications are 3190-3200 B.C. Story: Gilad was born in prehistoric time , the earliest record is 3214 B.C. . He grew up with his brother Aram Anni Padda and foster father . Thru the times he has fought as the fist and steel for the geomancers, having a range of lives and identities. During WWII, Gilad participated in many missions on the side of the allied forces. At the invasion at Dunkirk, he met Neville Alcott. When Gilad was wounded, Alcott tried to save him, loosing the use of both legs in the process . Gilad has had children thru time, they have all had a tendency to be sociopaths, e.g. his daughter who was Jack the Ripper, and he has had to kill them [4-6]. Skills & abilities: Gilad has low-level super strength, and extra dense body, making him hard to wound but in no way invulnerable. Gilad is immortal and is able to survive almost any physical damage short of decapitation. Some parts he is able to regenerate like his eyes , others can be reattached like his arm . Having been the fist and steel for Earth for about 5000 years, Gilad is an expert in weapons, fighting techniques and strategy. 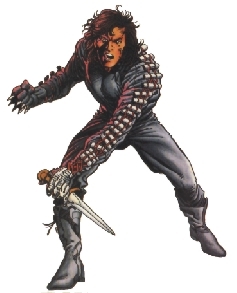 Equipment: Gilad usually wear a garment consisting of a right-hand glove with spikes for offence and a shielding row of hard material along the left arm for defence. His 90'ties suit also contains a metal coil in the plates on the left arm. © Michael Pilgaard. The character is ™ and owned by Valiant Entertainment, Inc.